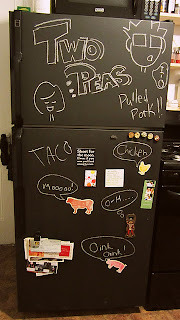 Mr P thought I was crazy for wanting to paint the fridge in chalkboard paint. But, being the calm and collected man he is, he just continued to say "ok.. I think that will look ok... are you sure you want to do it though?" I knew it was going to look better than the ugly off-white color it was, because I had seen it done on many other house tour articles on apartmenttherapy.com. The first article of inspiration, though, is basically my DREAM house. 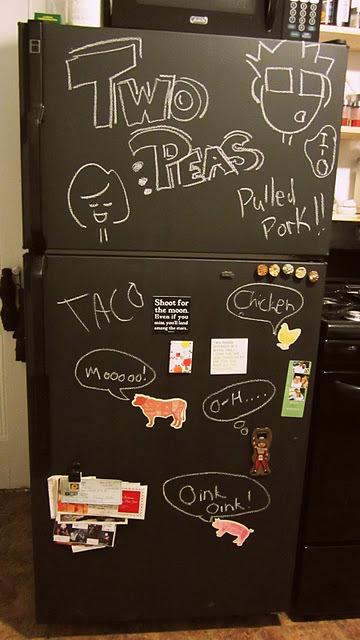 Here's the link to the article with the tour of the whole house, but do you see that fridge!?!? I was insta-obsessed. I highly urge you to look at the pictures from the whole house, and read the article too. 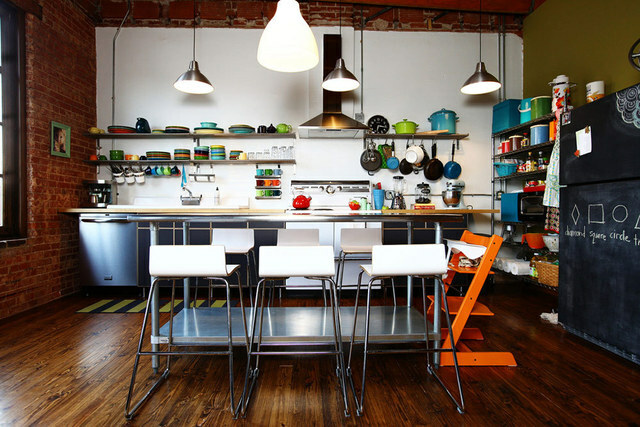 They basically renovated an old warehouse and turned it into the ultimate loft, including enough open space for riding skateboards in the house (wait, I thought Mom said not to do that?). I also highly urge you to watch their stop motion video of the mom's entire pregnancy in 15 seconds.. or better yet, I will just post it here for you, because it's that awesome! Hope you enjoy this amazing house as much as I do!! ...and take in some fun decorating ideas (though we all know, a loft this awesome is sort of a one of a find).